According to a press release by Honda, the new models will appear in North America this fall after rolling off of the manufacturing lines in Indiana and Ontario. Though not all available at once, models will include standard sedans and coupes, performance-focused Civic Si variants, a hybrid model, and a hatchback. Prices haven't been released, but expect them to start at around the same $18,000 base price for the current model and stretch to around $28,000 for a fully-loaded hybrid. Honda says that Android Auto and CarPlay will run on a 7-inch touschscreen entertainment system. That's "offered," not "standard," so prospective buyers will probably have to spring for one of the nicer trims or pay several hundred dollars to add the entertainment system to the base model. Since most cars are leased or financed, that might be easier to swallow than the $500-and-up aftermarket head units that currently support Android Auto. Other car manufacturers offering Android Auto for the 2016 model year include Volkswagen, Hyundai, and GM brands. 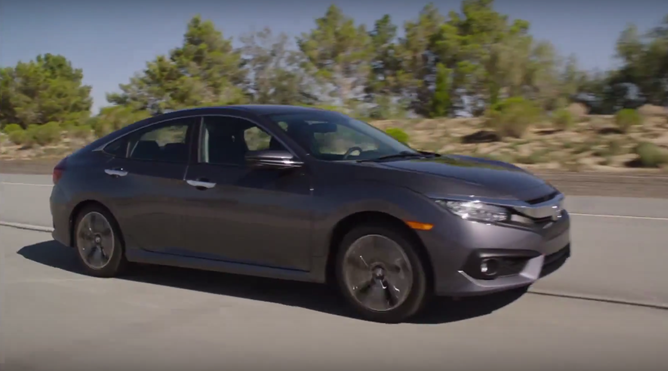 LOS ANGELES, Sept. 16, 2015 /PRNewswire/ -- Honda took to YouTube today to unveil an all-new, dynamically styled 10th-generation 2016 Civic Sedan, slated for sale in the U.S. this fall. With a more athletic stance and sportier driving position, the 2016 Civic Sedan is a new-from-the-ground-up design intended to recapture the sporty character of Civic while creating the world's best compact car – setting a new benchmark in the mainstream compact class for fun-to-drive performance, safety performance and fuel efficiency, together with a new level of refinement. The Civic Sedan is the first in a series of new 10th-generation Civic models that will include a sedan, coupe, high-performance Si models, a 5-door hatchback and the first-ever Civic Type-R model for the U.S. market, comprising the most diverse and innovative lineup in Civic's 43-year history. "This tenth-generation Civic is quite simply the most ambitious remake of Civic we've ever done," said John Mendel, executive vice president of American Honda Motor Co, Inc. "We are bringing more new technology and innovative thinking to Civic than ever before to establish a new benchmark for fun-to-drive performance, fuel efficiency, safety performance and refinement in the compact class." Backing up the new Civic's dramatic and sporty design with new power and efficiency, for the first time the 2016 Civic will feature two all-new engines – including the first-ever application of Honda turbo engine technology in the U.S. These powerful and fuel-efficient new engines combine with a sophisticated new body and chassis design to deliver incredibly responsive and sporty performance with a higher level of ride refinement and class-leading fuel efficiency. The 2016 Civic Sedan will be available with the Honda Sensing™ suite of advanced safety and driver-assistive technologies, including Collision Mitigation Braking, Road Departure Mitigation and, for the first time in a Honda, Adaptive Cruise Control with Low-Speed Follow – bringing new value to the compact segment. 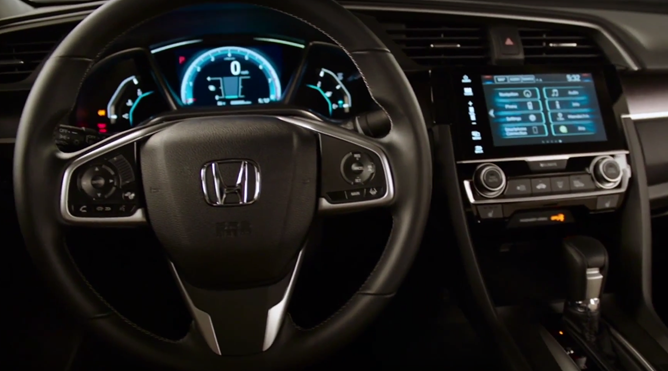 Further, the 2016 Civic lineup joins the freshened 2016 Accord in offering advanced smartphone integration with a new, 7-inch high-definition Display Audio touchscreen, offering tech-savvy customers a more advanced and intuitive connected-car experience. Apple CarPlay® takes the things you want to do with your iPhone while driving and puts them right on your car's built-in display. You can get directions, make calls, send and receive messages, and listen to music right from the touchscreen or by voice via Siri. Supported apps include Phone, Messages, Maps, Music and compatible third party apps. Apple CarPlay® is compatible with iOS 8.4 or later and iPhone 5 or later. The dramatic and sporty new Civic design is grounded in its more athletic stance and low and wide proportions. Compared to the current model, the 2016 Civic Sedan is nearly 2 inches wider and 1 inch lower with a 1.2-inch longer wheelbase, featuring a more compact and sporty front overhang, a longer, more aggressively sculpted hood and fastback-style tail. The taut and tidy proportions of the new Civic Sedan are complemented and accentuated by refined design details, including sleek and swept-back bodylines, a sharp and aggressive face and bulging wheel arches. The new Civic's more premium compact sedan character is also highlighted by its available LED exterior lighting, including new Honda LED headlights (in-line type), LED daytime running lights (standard) and distinctive C-shaped LED taillights (also standard). "The new Civic really is the embodiment of our global design team's goal of styling a dramatic form that follows and speaks to the dynamic function of this ambitious redesign," said Jarad Hall, Senior Exterior Designer and project leader of the Civic Sedan, Honda R&D Americas. "The low and wide proportions, with the wheels pushed to the outmost corners, emphasize the Civic's dynamic handling prowess and give the car a crouched and muscular look, like a tiger ready to pounce." The 2016 Civic Sedan will feature two all-new, more powerful and fuel-efficient engines. Civic Sedan LX and EX trims will be powered by a 2.0-liter, 16-valve, DOHC i-VTEC™ 4-cylinder – the most powerful base engine ever offered on Civic – mated to either a 6-speed manual (LX trim) or continuously variable automatic transmission (CVT). Civic Sedans in EX-T, EX-L trims and Touring trims will be powered by a 1.5-liter, direct-injected and turbocharged 16-valve DOHC inline-4, mated to a unique CVT, delivering a new level of responsiveness in this capacity class of turbocharged engine. The new 1.5-liter powerplant is the first turbocharged engine on a U.S. Honda model and the most powerful engine ever offered on a non-Si Civic in America. Both engines will offer top-in-class performance and fuel efficiency, and are targeted to receive EPA highway fuel economy ratings in excess of 40 mpg. Additional powertrain details and specifications will be announced closer to launch. The 2016 Civic will set a new standard for dynamic handling, steering, ride quality and cabin quietness in the compact class, courtesy of its all new platform, featuring the most rigid and tightly sealed body and the most sophisticated chassis in Civic history. Advancing the sporty character of this all-new Civic is its more sporty driving position, with a one-inch lower hip point compared to the current car. The lower hip point is enabled by the new Civic's lower floor and engine and its all-new suspension design. The new Civic chassis features a redesigned strut front suspension and a new multi-link rear suspension mounted to an ultra-rigid rear subframe. Torsional rigidity of the new body is improved by 25 percent, aided in part by more intensive use of ultra-high-strength steel. Twelve percent of the unit body is made of ultra-high-strength steel, up from 1 percent on the current model. Aerodynamic efficiency is improved by 12 percent to class-leading levels, in part through the use of full underbody covers—a Civic first. Despite its larger size, the new Civic unit body is 68 pounds lighter than before, while new body-sealing techniques result in a 58-percent reduction in cabin air leaks. Class-leading cabin quietness is further improved by the use of premium noise-reducing features, including a flush-mounted acoustic glass windshield, a more tightly sealed engine compartment and triple-sealed doors. To achieve the Civic development team's high targets for dynamic performance and refined ride quality, the new Civic Sedan utilizes hydraulic compliance bushings, a technology typically reserved for more expensive vehicles, aiding the isolation of road vibration. Additional new chassis technologies include variable gear ratio steering, beefier front and rear stabilizer bars and standard 4-wheel disc brakes, along with the application of new Agile Handling Assist brake-torque vectoring technology for more precise and agile cornering. The new Civic interior is designed to offer the most comfortable, sophisticated and premium-feeling cabin in the compact class. An additional 3.7 cubic feet of interior space translates into the largest cabin in the compact segment with 2 inches of added rear-seat legroom versus the outgoing model. In front, new ultra-thin front roof pillars enable class-leading forward visibility; and at the rear, trunk space has been increased by 2.6 cubic feet with a lower liftover height, larger opening and wider and taller cargo area. Civic Sedan EX and above trims will feature a 60/40 split and folding rear seat. The 2016 Civic Sedan offers customers more premium features than ever before. New standard equipment includes automatic climate control – dual-zone on EX-L and higher trims; auto-up/down front power windows; an electronic parking brake with Brake Hold; Walk-Away auto door locks and an adjustable driver's seat thigh support with 14 degrees of tilt (EX-L and above). All Civic Sedan models also feature a larger, reconfigurable new center console with up to 7.2 liters of secure storage space, approaching SUV levels of console utility. The new Civic interior strikes a more premium tone with high-quality materials and high-contrast finishes. These include a new one-piece, soft-touch instrumental panel with molded stitching; more premium seat fabrics; a new full-color TFT center meter (EX and above trims); a center console with piano black finish and high-contrast sliver bezel; door inserts with live stitching; an LED shift indicator and LED overhead lighting; and for EX and higher trims, a leather shift boot. Upper grades offer even more premium features, including an 8-way power adjustable driver's seat, 4-way power front passenger's seat, heated front and rear seats and heated side mirrors. Civic Sedans for the North American market will be produced at the company's Greensburg, Indiana and Alliston, Ontario, Canadaauto plants. The new Civic's 2.0-liter and 1.5-liter turbo engines will be manufactured in Anna, Ohio, and the vehicle's two automatic transmissions (CVTs) will be sourced from Honda plants in Russells Point, Ohio, and Celaya, Mexico. The new Civic utilizes numerous new manufacturing processes and technologies to advance quality, efficiency and fun-to-drive performance – the result of new investment in Honda automobile and engine plants in North America. This includes the addition of the company's innovative new inner-frame weld body construction process in both Indiana and Canada, a system first utilized for production of the 2015 Honda Fit. This new general weld system creates a more lightweight, rigid and strong body structure that helps enable the Civic's class-leading fuel efficiency, outstanding safety performance and fun-to-drive experience.